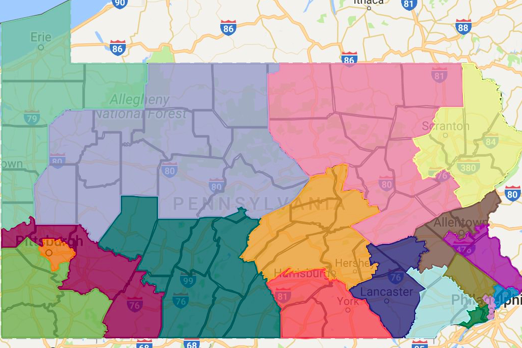 Pennsylvania Governor Tom Wolf's proposed revision of state Congressional district map. Pennsylvania Gov. Tom Wolf proposed an alternative version of a congressional district map to replace the gerrymandered political boundaries struck down last month by the state Supreme Court. The new proposal came late Thursday night after the Democratic governor vetoed a legislative submission from Republican leaders in the Senate. “From the outset, I have made clear I wanted a map that was fair and removed the partisanship that Pennsylvanians have been forced to live under since the 2012 elections,” Wolf said. “This map takes features from Republican and Democratic submissions, while still meeting the court’s orders and opinion, to provide Pennsylvanians with a fair map." In its January decision, the Democrat-controlled court determined that the district map enacted by Republicans in 2011 "clearly, plainly ad palpably" violates the state constitution by favoring the GOP. The court's ruling required that any revised map must consist of contiguous districts that do not divide counties, cities, municipalities or wards, except when needed to ensure that districts have equal populations. Republican Senate President Pro Tempore Joe Scarnati last week revealed a proposed alternative map and outlined how it satisfies state constitutional guidelines. Multiple independent analyses of the proposal concluded that it would still have nearly identical effects on the partisan compositions of Pennsylvania's districts, again favoring Republican candidates in the run-up to this year's pivotal mid-term elections. The Supreme Court had given Wolf a deadline to approve a redistricting plan no later than Feb. 15. If either the legislature or Wolf failed to approve new lines, the Supreme Court said it would undertake the revision on its own using the evidentiary record developed in Commonwealth Court. Wolf said his proposed map and the Republican alternative were both independently analyzed by Tufts University mathematician and gerrymandering analyst Moon Duchin. In a report on her findings, Duchin said Wolf's map showed no partisan skew when compared to more than a billion randomly generated maps. Under Wolf's plan, Pennsylvania's map would have the same number of splits as the Republican submission, but would reduce the number of counties split more than once and would avoid splitting any county more than three times. “While my preference would have been for the General Assembly to send me a fair map, I believe this map sets forth a new standard of fairness," Wolf said. Pennsylvania's congressional districts are considered among the most illegally partisan in the country. Despite outnumbering Republicans by a 5-to-4 margin among registered voters in the state, Democrats hold just five of Pennsylvania's 18 congressional districts. The Pennsylvania Supreme Court's decision, set against the backdrop of a U.S. Supreme Court review of Wisconsin's congressional districts, stemmed from a legal challenge by a group of 18 Democratic voters and the Pennsylvania League of Women Voters. The Wolf administration's full plan, map files and district analysis are available for review here.